Automation could replace many jobs in the region in the coming years but such technological advances will also make it even harder for local firms to find high-skilled staff to operate the new equipment, according to a new report. One way to meet this need is to encourage students to focus on so-called Stem subjects - science, technology, engineering and mathematics, according to the report by the International Labour Organisation (ILO) yesterday. "Despite significant indications of innovation and technological progress, enterprises in Singapore reported that costs and skills are the biggest barriers to upgrading technology, with lack of skills reported more frequently in Singapore than on average in Asean," the report said. Singapore accounts for half of Asean's "high-skill, technology-intensive" manufacturing exports, followed by Thailand (19.6 per cent) and Malaysia (15.7 per cent). The ILO also found that 56 per cent of the salaried workforce from Cambodia, Indonesia, the Philippines, Thailand and Vietnam are at "high risk" of being displaced by technology in the next decade or two, with workers in the garments industry the most vulnerable. The ILO surveyed 4,076 regional enterprises across the manufacturing and service sectors, including 301 from Singapore, as well as students from over 2,700 universities and vocational colleges, including 206 from Singapore. Firms here named rising labour costs as the biggest threat they face over the coming decade. The United Nations agency noted that the Singapore Government has taken steps to use new technology to deal with the skills shortage and mitigate rising labour costs. Earlier this year, for example, the Government earmarked over $450 million to expand the National Robotics Programme over the next three years. 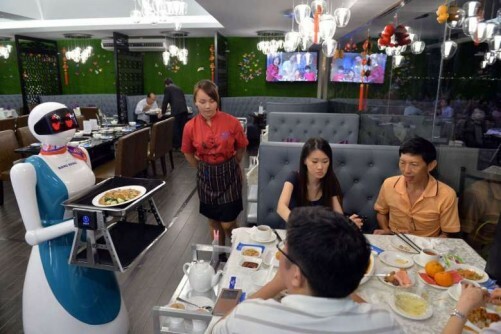 "Increased automation will also create considerable high-skilled work, as optimised robots and machinery will need capable technicians and engineers," the ILO noted. It also warned that workers here "are not immune to rising skills needs brought on by technology, and students need to be encouraged to focus on Stem subjects to meet the future needs of enterprises in Singapore". But the problem is more complex than that, argued CIMB Private Banking economist Song Seng Wun. "Even though we push students to go for engineering courses, maybe only one out of 10 ends up doing what they did in school. The rest move to a more lucrative sector like financial services," he said. "So it's a bread-and-butter issue, and closing that pay gap is where the difficulty lies. Either pay comes down on the financial services side, or employers on the engineering side push up wages to attract and retain talent. "This has been the challenge for the longest of times."